1.. Peel off the skin of cassava, then use grater for making grated cassava, remove the juices from cassava using cheese cloth.. Set aside. 2. Wash purple yam, boil until soft, peel off skin and smash the boiled ube,.. Until you make a mashed ube.. Set aside. Get your Steamer and pour half amount of water, let it boil while we prepare the mixture. Ready your tray with banana leaves and greased with oil. 3. 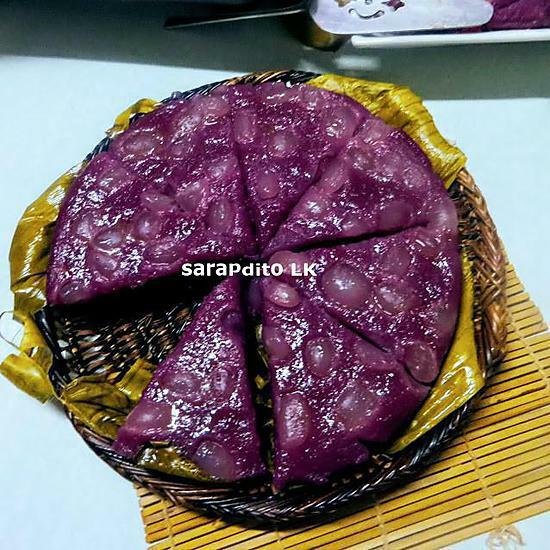 In a huge mixing bowl, combine grated cassava and purple yam, add 2 cups sugar, stirring until becomes purple color.. Adjust sugar while mixing. 4. Next we can put coconut cream or milk, continue stirring until completely combined. Lack of liquid makes your cake tough, add more liquid if want soft texture and not rubbery. 5. Next crack the eggs and put them in and mix again. 6. Meanwhile we can add 2 tbsp butter.. Continue mixing..
7. Then pour in the batter, and scattered the palm fruit on top, then steam and cook for about 45 minutes or so... Cover with banana leaves or cheese cloth if you have.. Then check it sometimes, while cooking. 8.. When you think its already cooked, brush some butter on top of the cake.. Let it cool for a minutes then ready to slice.. Or serve while it's warm..
For Complete Tutorial visit Bog. com link below and my You Tube. Pwede ko po ba sya lagyan ng condensed milk and evaporated milk? 85Guest, Guest and 83 others find that it looks really good.